"Do you want to go in the car?" So... Lily... head tilt to the left is 'car' and head tilt to the right is 'treat'? or is it the other way around??? You two are SO cute!!! Happy December!! Benny & Lily you are beautiful !!! Love the pictures. You two are so funny! AND so cute! Wish our M would take some new special pics of us. We heard her mentioning it BUT nothing happened. She may be a little nutty... but those are GREAT pix of you guys! OMG! How do you tilt your head that way?? That is so cute!! Such cute pics. We love the synchronized ears in the last one. we just hope a similar photoshoot is not in our future. Phew....looking at your tilting heads is making me slightly sea-sick. Sure you're not on a boat? Did you get a treat/walk/car ride for your efforts?? You two need to send one of these off to PIP fur his Operation Occupy the COUCH ... PROTEST thingy. He could use you help. GRRRRRRRRRRRRRRRRRRRRRRRRRRRRRRRREAT PICS.. every one of them. Hey guys, I'm LOVIN' how you give Corgis a run for their biscuits in the EARZES department! LOVE the head tilt! so cute! How adorable do you two look! Expert head tilting, by the way. Very cute, but did she follow through on the offers? Great pictures! Mom said stuff like, "Will you just sit still?!" And kept saying something about Pete and his sake. We don't know Pete. But she was not happy with us. Thats funny. It is easier when you just apease her and it will all be over with, Me and Addy do the same thing here, Peeps!!! We get the same drill here but all of the treats are worth it! 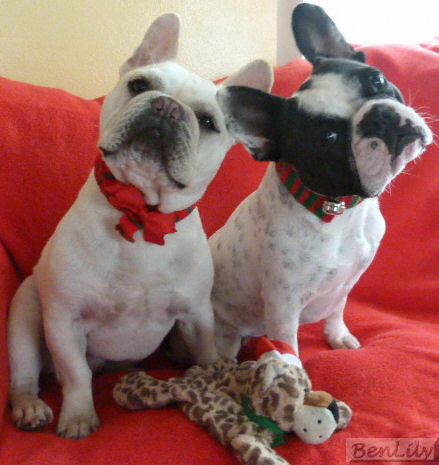 Oh my goodness, you guys have your Christmas collars on, a nice red background... I think it's a wonderful time for a Christmas photo shoot! I love love the last picture, with your heads tilting in the same direction! We're sorry - but when the end result is us seeing your cute faces we're all for silly photo attempts! OMG I am dying from cuteness!!!!!!!! this is the most precious thing!!! Tell your Mom she isn't alone with the silly way she takes photos, I shouldn't say "silly" because her photos are always great! Hey, as long as you gots the treats AND got to go for a bye-bye ride! Woof! you guys looks so fabulous on your shots! Oh my gosh, that is too cute for words!! I can just hear the squeaky voice too, because I do that same thing! This post made me laugh out loud. Goodness gracious Lily, what big ears you have! 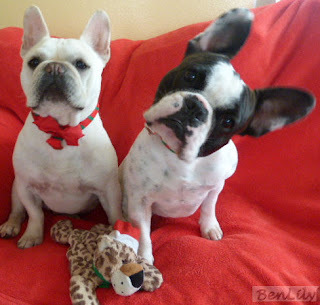 Love that double head tilt, SO cute!!!! When I first saw the pictures I wondered what she was saying! How cute are you???? Did you get a treat? Did you get a ride in the car? You had a great photo shoot, hope you got some of each!! hehe I used to drive my kids crazy with the annual holiday photo shoot. But you guys look so adorable, how can your mama resist?! you two, are so cute.,thanks for making me smile..
You both could apply for professional modelling assignments! and must say the photograher is REAL GOOD. Never mind what the neighbours think...or get to hear for that matter!! pee ess: we totally LOVE your Q n A rounds.Only we have so many Qs we don't know which ones to ask! Love the head tilt. We get that same high voice and promise of treats...must be from the peeps handbook or something. *sigh* Unfortunately...it is that time of year again...when we are subjected to such horrors as photo shoots, wearing ridiculous antlers (eeek!) and other Christmas apparrel. 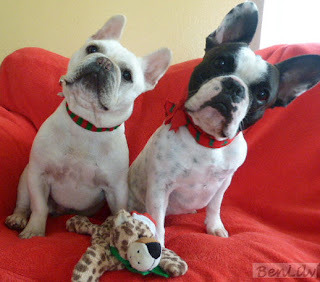 Thank dawg December comes only once a year....we're just say'in! You are pawsitively perfect Christmas subjects! Can I say something? You two are gawwwwgeous!!! I love the head tilt!!! I make similar crazy noises when I'm photographing my dogs. The difference is that I'm usually outside - and I must sound mighty funny to anyone who happens to be nearby!!!! You have a fabulous holiday photo (or three)! Ever notice how that voice gets higher and higher and dumber and dumber the longer you go without striking the perfect pose? It could shatter glass, I tell ya. we hope you got all the promised treats.